This year marks 20 years since Cosmic Wonder was founded. Yukinori Maeda who moved his studio and residence to Kyoto’s Miyama region this winter to “establish a Ryugu” within the village of thatched roof houses, mentioned how he had been rushed off his feet the day before the interview, busily engrossed in shoveling snow from morning to dusk. What I saw in the Skype screen beyond the house’s traditional sliding windows, were rows of pine trees covered in a deep veil of snow. Between the trees were the first traces of blue sky that had experienced in several days. On the other side of the Skype screen, Maeda proceeded to speak to me about the photography book that he had taken in New York 20 years ago, his first show at Paris Fashion Week, as well as his creative activities and attempts to pursue the world of the mystic and divine. From time to time throughout our conversation I had captured glimpses of Cosmic Wonder’s sharply refined spirit that set out to open up new horizons that have never been explored before, and the fluctuating thoughts that drifted here and there between the past, the current, and that which lies beyond. N.H: Today I would like to begin by reflecting upon the first 10 years of Cosmic Wonder’s activities. You had initiated Cosmic Wonder soon after graduating from university in 1994, yet I believe its actual founding was in 1997. Y.M: I started Cosmic Wonder with my circle of friends after graduating from an arts university with a degree in architecture. At first we were really just trying to find our way. None of us had experience of working before so we were going about doing things by our own means. By 1997 we had determined our sense of direction, and thus made it into a company. We don’t have need walls in our hearts anymore. Where did the walls in our hearts go? We attached a wall to the dress. It’s better to attach a sorrowful wall to the dress or show. N.H: Cosmic Wonder’s first work was a photography book entitled, “The dress attachable a wall” (published November, 1999). At the time there had only been a few people in Tokyo who were aware of Cosmic Wonder’s activities, yet I vividly remember seeing the photography book being in a large display in On Sundays. Could you please tell me how this publication had come about? Y.M: I wanted to produce “clothing that is not clothing as we know it, but is instead an object of creation.” The intention had been to depict situations of wearing such clothing in the everyday through the context of this photography book. In making the publication I was introduced to members of a New York band called “Actress.” I asked them to wear the dresses with the attachable walls, and then photographed them in their daily lives in New York. N.H : Four models were photographed over a period of four days? Y.M: Yes, although the band no longer exists. N.H: Did you take the photographs yourself? N.H: At the end of the book the four models are asked the question, “how was it like wearing a dress with an attachable wall?” I thought it was interesting how each one of them had responded in entirely different ways. The answers ranged from, “It was amazing! The walls were much warmer than I thought” and “They really got in the way” to “I took it off at the end of the night. It got in the way of my band practice” and “It gave me a sense of security. Before wearing it I had felt a sense of sadness, but once I tried it on, I felt amazed.” In the early years of Cosmic Wonder, you had two separate lines. There was a collection line that you presented as artwork, and there was Cosmic Wonder Jeans as an everyday wear line. I recall that “The dress attachable a wall” was part of the collection line. How were the dresses with the attachable wall actually made? Y.M : They were created through a slightly unusual method. A piece of felt that was made to look like a wall was needled and integrated into the see-through body cloth. The body cloth had been left in its rough-hewn state, and resin was applied to the edges to prevent fraying. N.H: I would further like to ask you about this aspect of the “wall and dress becoming attached.” In Cosmic Wonder’s early years, this idea of “something attaching itself to clothing” seems to be a recurring theme. At the time you had explained this as “combining things that don’t usually go together in a manner like white magic,” and thus attached things to clothing like walls, handkerchiefs, broken electrical and lighting appliances, curtains, and furniture such as curtains, drawers, and coat hangers. These are all familiar objects that we find in our daily lives. From there a sense of beauty with an unexpected air of tension is born, however what actually creates this scene is clothing that can be worn and is in fact more wearable than meets the eye, further instilling those who look upon it with a mysterious experience. Where did this idea of attaching surprising yet familiar objects to clothing come from? Why had you first decided to attach a wall? Did it have anything to do with the Berlin Wall? Y.M: First of all, the idea of attaching a wall to a dress had initially been inspired by my desire to give a sense of what’s between the body and something else, or what I may call, the existence of the aura. I wanted to channel my interest towards the spiritual world into something that I create, but I didn’t exactly know how to go about doing this. When I look back on those times, I feel that I perhaps had been making work while thinking about the relationship between the familiar things that I see in my surroundings, or in other words, the everyday, and clothing. I may have found myself envisioning something extremely vast within the context of something very small. Aboard the steamer was a lone woman. She had a large sharpless bag, which she carried the bag around with her. She answered that it was her child, as well as a life preserver. If the ship were to go down, her child would float in the water. The other passengers thought the woman was very strange. Did she harbor some terrible loneliness or anxiety? But actually, the woman seemed more positive than anybody else on board. The woman from the steamer was featured in a TV documentary program. She had disembarked from the vessel and was now living in a small country village. “I don’t like country people,” she said. Yes, she was still carrying that big bag. A girl who had seen the woman on this program copied her by filling a plastic with air and tying it to her skirt. 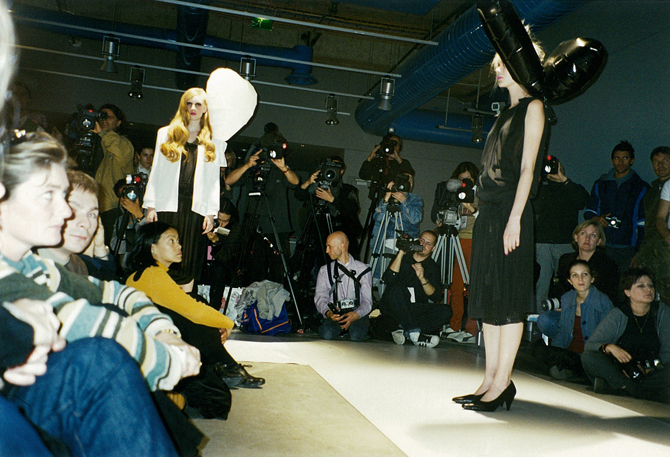 N.H: “Steamer” is a work that was presented in 2000 on the occasion of Cosmic Wonder’s first ever show at Paris Fashion Week. There were a lot of decorative elements involved and it had quite a different impression to your current works. With “Steamer” followed by “Steamer Doll,” there had been two consecutive seasons that conveyed a similar sense of direction. Y.M: The models wore high-heels and looked like dressed up old women (laughs). They were like clothes for people who usually don’t pay attention to fashion. Back then, every time I announced a new collection it would be accompanied by a short poetic story, and at this time it had been a narrative about a ghost-like woman. She was the kind of nameless person who you’ve either met somewhere or who you may encounter in some place. I wanted to do something that you might do with found photographs, but in this case using clothing. N.H: Confronting the abrupt encounter between heterogeneous entities? Y.M: A sense of wholeness that evokes one to imagine the ambiguous areas. Y.M: I had decided to create a selection of new works twice every year. I think it was important for us to a have a place where we could present them. N.H: Since “Conversation with Electrical Appliances- Broken Radio, Worn-out TV…” that followed, you seemed to venture more towards an installation-based approach. I feel that “Conversation…” had indeed served as a turning point of sorts for your practice. Y.M: Yes. From around this time I had begun to think more strongly about notions of “space” and “art.” What kind of effect does it have on the space when it is inhabited by people wearing clothes? Contemplating a cohesive sense of beauty that involves not only the clothes by also the space is something that persists to this day. At the same time, in addition to the people who come to see the presentation, it also concerns an interest towards how the people who have purchased the clothes appear to look like in the space that they are in. N.H: I see. I recall that you have continuously engaged in the act of documenting the space in Paris where you have presented your collection, taking photographs of scenes when the model and audience are absent. In this respect, from early on you have held this awareness of “the space itself also being the work.” In retrospect it seems like a natural thing for you to do, but I feel that there must have been a strong sense of will behind the very act of taking these documents in the midst of those busy days in Paris. It was a time, in which the theme of art and fashion had been enthusiastically discussed, and thus in Paris Fashion Week many new collections were presented in the form of installations rather than fashion shows. Y.M: That had indeed been the case, yet there were rarely any presentations that gave you the feeling of being fashion and art at the same time. My understanding was that you could not call something art simply because it embodies a visually surprising form. I indeed thought that you could create something really interesting if you could take a step further to pursue fashion in the context of its interest as art.